Beginning on Sunday, February 7, 2016, the Parish of St. Vincent Ferrer and St. Catherine of Siena will offer a three-part series of workshops on Dominican chant, the dialect of Gregorian chant used by the Order of Preachers. Led by Fr. Innocent Smith, o.p., the workshops will take place on three successive Sundays, February 7, 14, and 21, from 3:00–3:50 pm in the Parish Hall of the Church of St. Vincent Ferrer (in the undercroft the Church, accessible from Lexington Ave. to the right of the front steps of the Church). On February 14 and 21 the workshop will be followed by Vespers at 4:00 pm in the Church, giving participants a chance to sing some of the chants they have studied in the workshop. To RSVP for the workshops, please email parish@svsc.info. 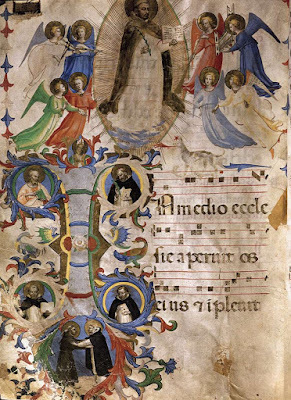 A leaf of a Missal decorated by Saint Fra Angelico, the famous Dominican painter, from the museum of the Dominican church of San Marco in Florence, ca. 1430.